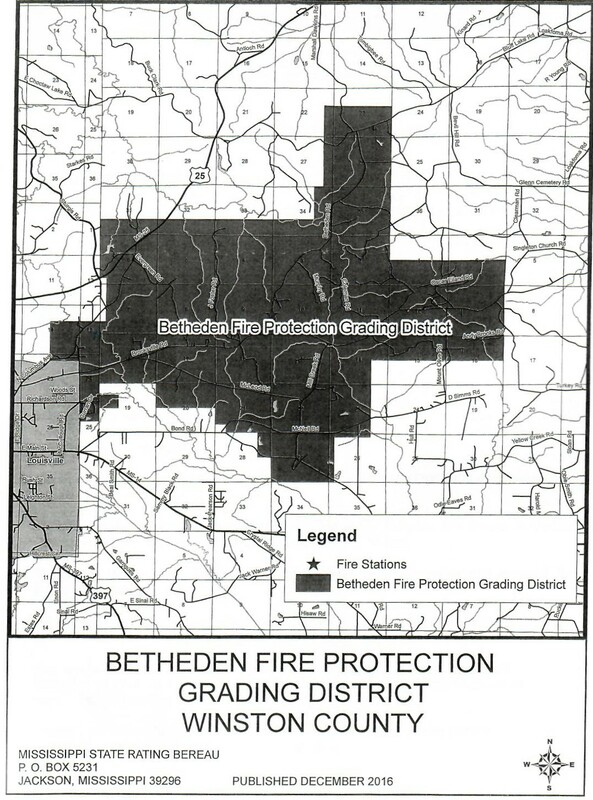 In September of 2016 the Winston Board of Supervisors voted to establish the Betheden Fire Protection Rating District in northern Winston County with the goal of improving fire rating in the area and as a result reduce insurance costs for residents in that area. Property owners who have dwellings within the district should now be eligible for a reduction in insurance premiums based upon this rating. As of December 19, property owners should contact their insurance companies to see if a reduction in rate is possible. Rate reductions could be as much as 30%. To determine if you fall within the confines of the Betheden Fire Protection Rating District, a basic map is provided below. If you have more questions, contact your insurance agent or local officials concerning this matter.